Every good BBQ needs a great coleslaw dish. 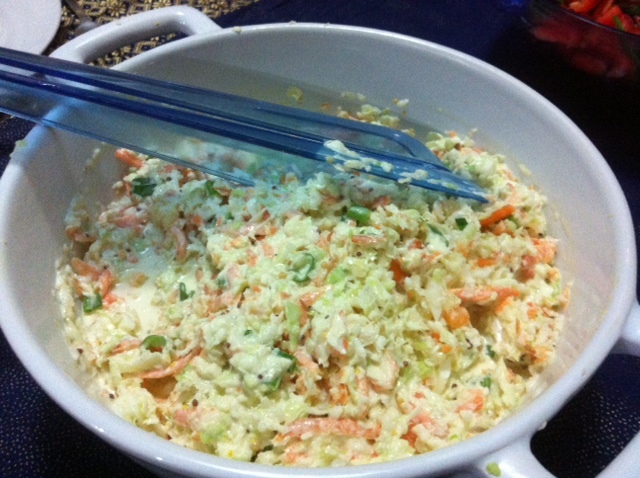 I generally find coleslaw recipes to be a bit hit and miss, and bought coleslaw tastes like vinegar, but the dressing I have used in this dish adds a bit of sweetness and it got a thumbs up from my family. It will be perfect for the BBQ’s and picnics we’re trying to cram in while this beautiful weather holds out. I have only used white cabbage because that’s all I could get my hands on at the shops today, but that’s ok, because I think the kids find the red cabbage a bit too bitter for their liking. Combine the mayonnaise, sour cream, mustard, honey and lemon rind in a bowl and stir to combine. Place the cabbage, carrots and spring onions in a large salad bowl. Add 1/2 of the dressing to the cabbage mixture and stir thoroughly before adding the remaining dressing. This recipe makes quite a lot of dressing, so you may like to add a little at a time until you get it how you like it. Notes: You can get fancy and use 1/4 white and 1/4 red cabbage if you can get your hands on a red one. Hi, I'm Rebekah, a happily married mum of six who also happens to be a cooking and baking addict and new accidental blogger. I live in Rural Sout-East Queensland, about an hour and a half from Brisbane . I have a 16 year old son who is itching to learn to drive, a 9 year old daughter with Type 1 Diabetes who loves to play her violin and dance her way from one end of the house to the other, 7 year old twins, a son who loves cars, trucks and bike riding with his dad and his twin sister who loves to paint and draw her life and hang it on mummy's fridge. Then there is Little Miss 5, the happiest child I have ever met, very independent, and she dances and sings everywhere she goes, followed closely by her almost 3 year old sister who thinks she is the boss of everything and is a mixture of all of her siblings put together. To say life can be exhausting is an understatement, but we wouldn't have it any other way. Plate4Eight came about through my need to get organized in the kitchen. I no longer have time to go searching through cookbooks and folders for "that recipe we liked last week", and the more organized I am, the more time I have to spend with my family and experiment in the kitchen, which is my form of relaxation. So, if you're looking for something to have for dinner tonight, or just want to try something new, have a look around. I hope you find something you like.